Ottolenghi is one of the most iconic restaurants in the country with its unique blend of exquisite, fresh food, abundantly presented in a cutting-edge, elegant environment. Ottolenghi is the celebrity chef is credited with introducing Israel cuisine to the London restaurant scene. 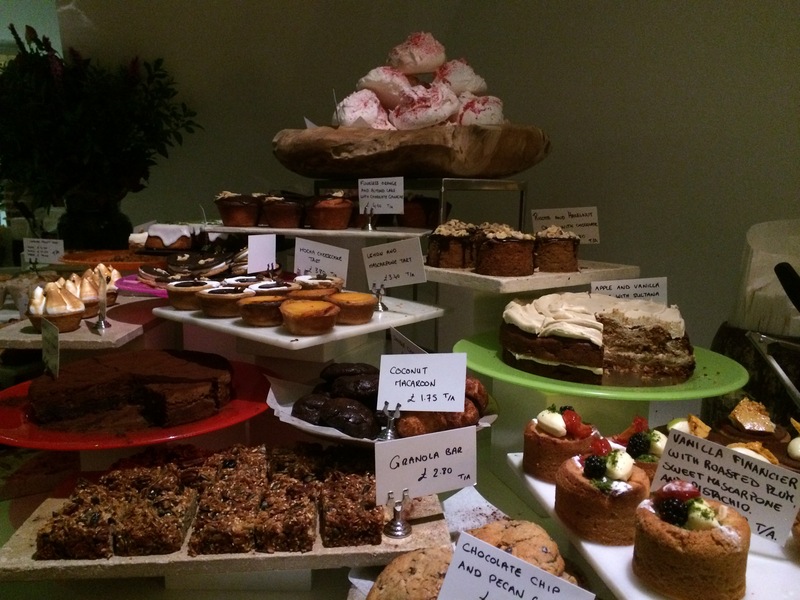 Ottolenghi’s cakes and breads are equally famous. 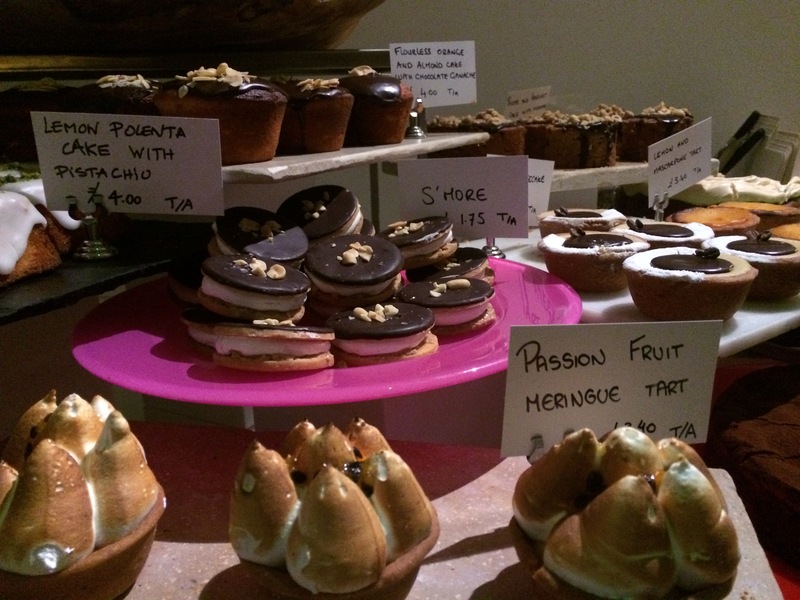 The Spitalfields branch of Ottolenghi is the newest and largest of them all. It includes a deli counter showcasing its array of colorful salads and freshly made cakes, a bar serving exciting cocktails such as with kumquat and passionfruit and a more formal dining space with all white walls, candelabras and low lighting. Sculptured artwork made of cardboard has been added and apparently they used a 100 year old photo of the street to help get it back to its original look. The head chefs Yotam Ottolenghi and Sami Tamimi are inspired by their respective childhoods in West and East Jerusalem but rest on numerous other culinary traditions, ranging from North Africa to Lebanon, Italy and California. The dishes are quite small and they recommend ordering 2 to 3 dishes per person. The four of us decided to share six plates and then get desserts. The fish dishes arrived first. 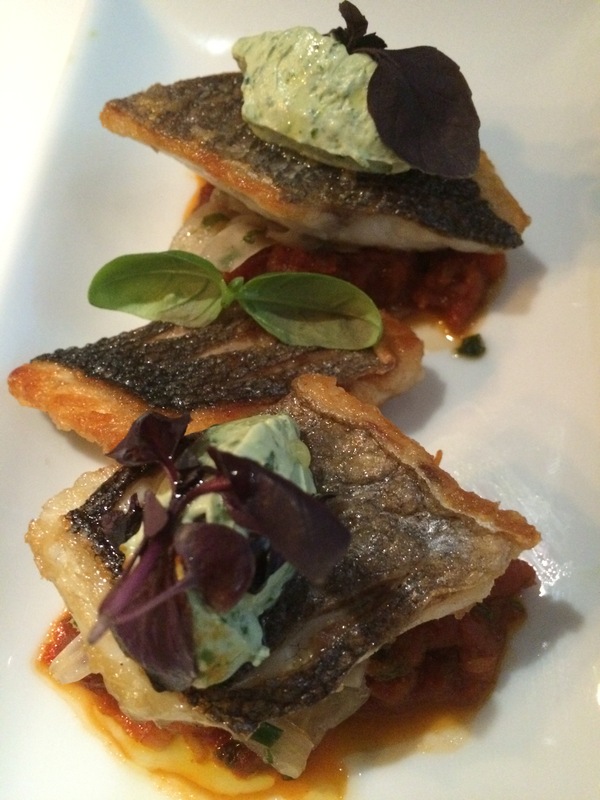 The sea-bass fillets were served with fennel and tomato salsa and topped with a delectable, green kohlrabi and basil labneh. 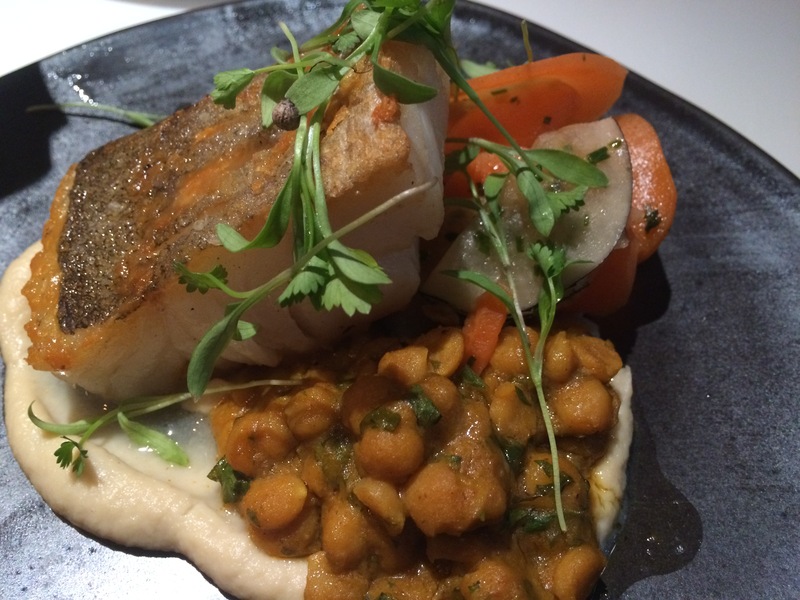 The pan fried Pollock came with cauliflower puree and hints of Indian with the sides of chana dal, carrot and radish pickle. The prawns in a sumac and fennel marinade was quite spicy but the heat was balanced well with the feta, although I felt the bitterness of the fennel to be overpowering at times. Next we got to the meat dishes. The tea-smoked lamb cutlets were succulent came in a garlicky, charcoal-grilled aubergine mix, jalapeno sauce and pickled lotus root. An absolutely lip-smacking combo. 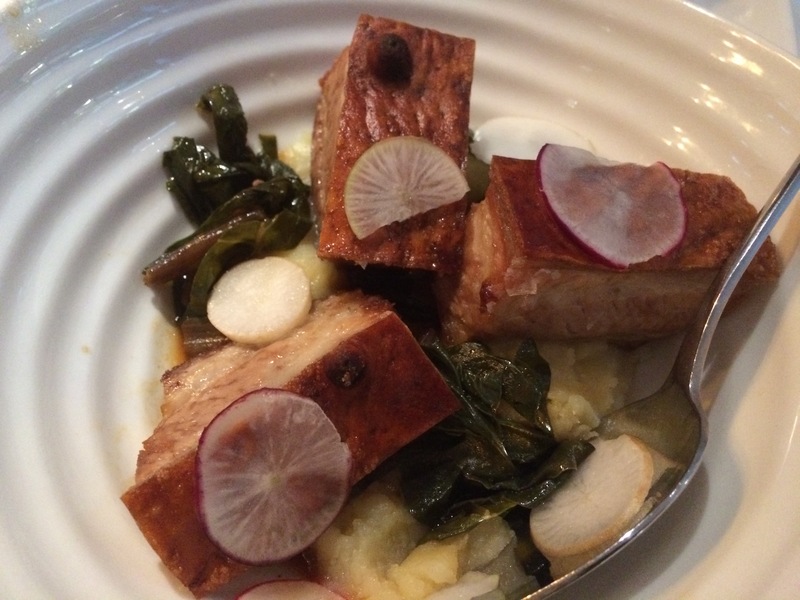 The twice cooked pork belly was one of the dishes I found a little less exciting because the side of salted cod potato seemed to be lacking on the flavour front when compared to the other dishes. The venison koftas with green tahini sauce, lemon syrup with coriander was a wonderful take on the Turkish kebabs. The dishes were all noticeably tiny though, so that we definitely all had space for dessert. Thankfully, these were all enormous. The passionfruit and meringue tart was probably the best. The meringue was soft and gooey while the custard had a rich flavour and creamy texture. The chocolate fondant cake and as well as the apple, raisin and carrot cake were both soft, moist and delicious. The crumble with poached pear and marzipan was probably the only one I could fault because it was more like a big muffin than a crumble in terms of texture. Overall, the desserts were definitely a success though. Service can be a little aloof but is efficient. They were also open to getting us extra servings of delicious, freshly baked breads. 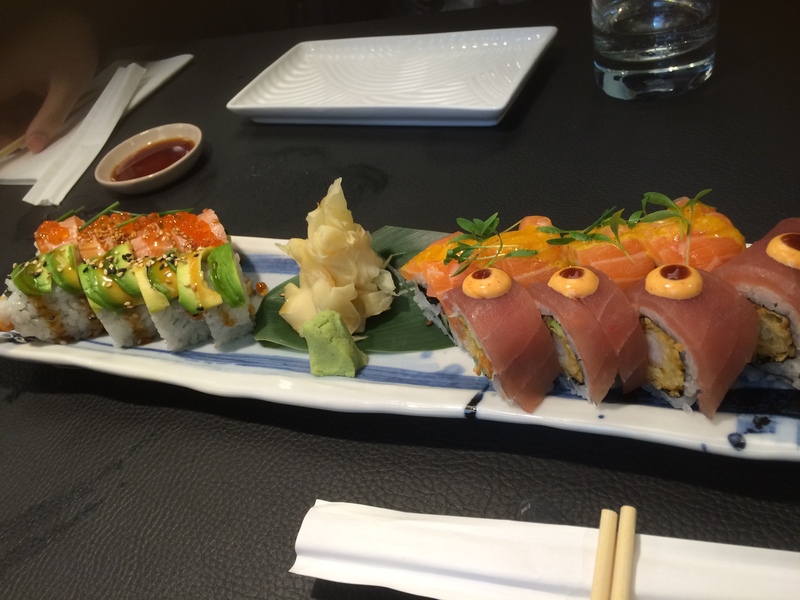 One of the most exciting fusion menus you can find in London and with dishes all perfected in taste and presentation. Yotam Ottolenghi has sold multiple cookbooks worldwide and introduced the Brits to Israeli food and a visit to this new venture of his makes it evident why they all love him so much. For Tonkotsu, a style of Japanese with noodles in a broth made from boiling pork bones. The restaurant is split over two floors, and is minimally decorated with closely packed tables and bench seating and sashes along the walls. Since the restaurant takes no reservations and doesn’t have a bar, you will have to just queue by the door which is worsened by the fact the kitchen is right next to the door. So you can smell all the delicious food which gets you starving yet all you can do is wait in the queue and hope that you can potentially get a table in the next hour. The menu is short and simple with a focus on ramen noodles. 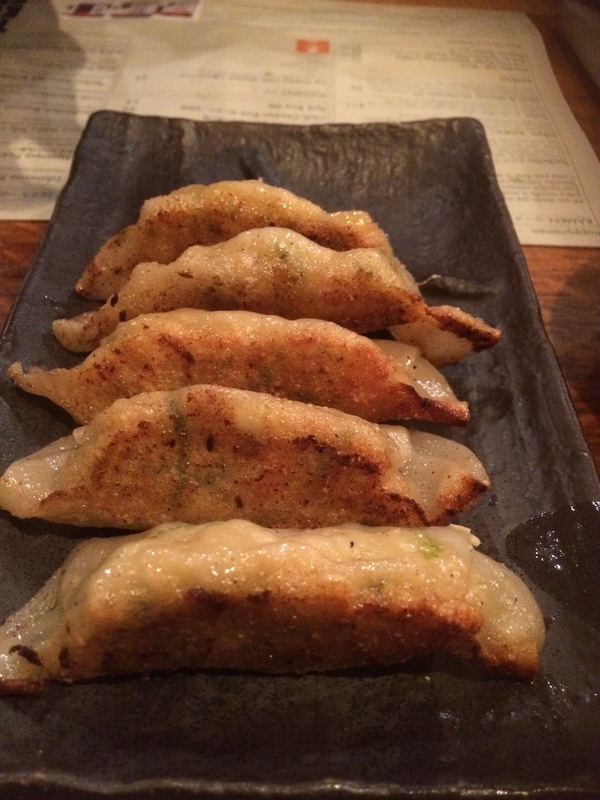 We start off with a plate of gyoza dumplings which had a crispy base and a garlic prawn stuffing. They had a good bite and were quite tasty. We moved swiftly onto the ramen noodles. My friend opted for the signature Tonkotsu, with hand-made noodles in a rich, creamy pork stock and thin noodles and topped generously with slices of melt-in-the-mouth pork belly, spring onions and bean sprouts. 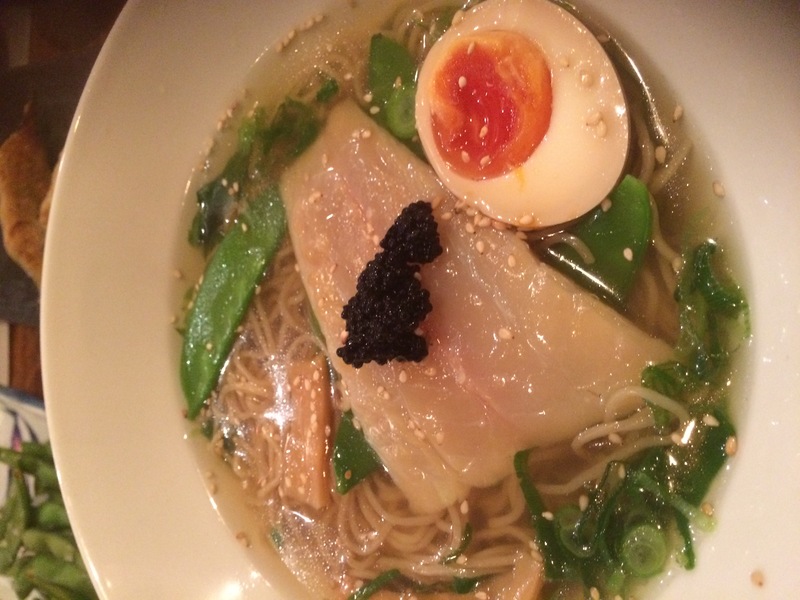 I went for the Soho ramen, which was made with smoked haddock, pak choi, and topped with caviar. The broth in this case was clearer. The smoked haddock itself has quite a mild taste which goes surprisingly well with the pork broth but the intense flavor of the caviar definitely overpowers the subtle flavours of the haddock and the bone broth, which was a total shame. Additionally, I found the broth in both the dishes to be lacking a bit of kick and had to add a lot of soy and chilli oil to get it to the right level of spice. I found fellow diners doing the same. Tonkotsu definitely has some exciting variations on the classic ramen. In my opinion, these are not the most flavourful bowls of ramen on offer in London, yet the noodles are home-made, soft and bouncy and the servings are big and comforting. This is one of London’s oldest ramen joints and if you’ve never tried ramen before, this is one of the best places to give it a shot. For Peruvian seafood, skewers and Pisco cocktails at London’s oldest Peruvian restaurant. 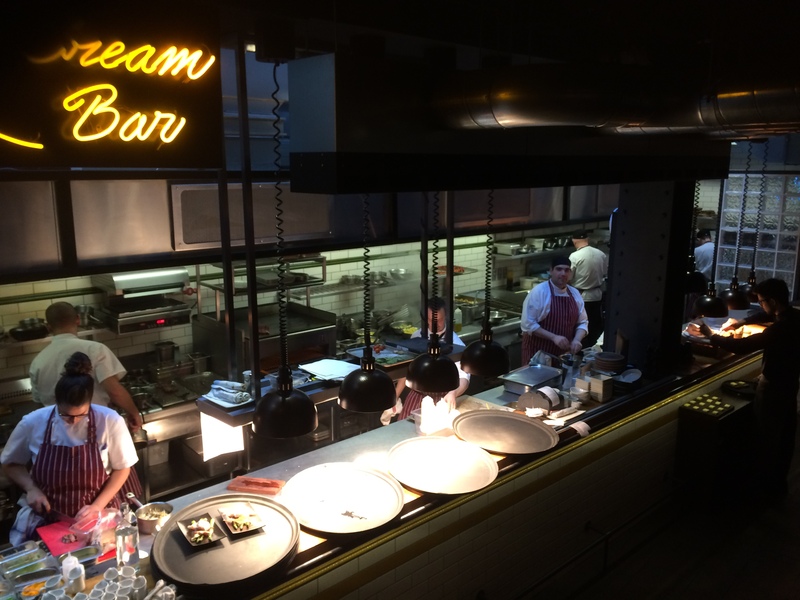 Located in an old Soho house, the restaurant offers seating in the dining area or at their steel counter bar where you can see the chefs at work. The space is decked with tiled walls, green paneling and plentiful Peruvian posters and photographs. 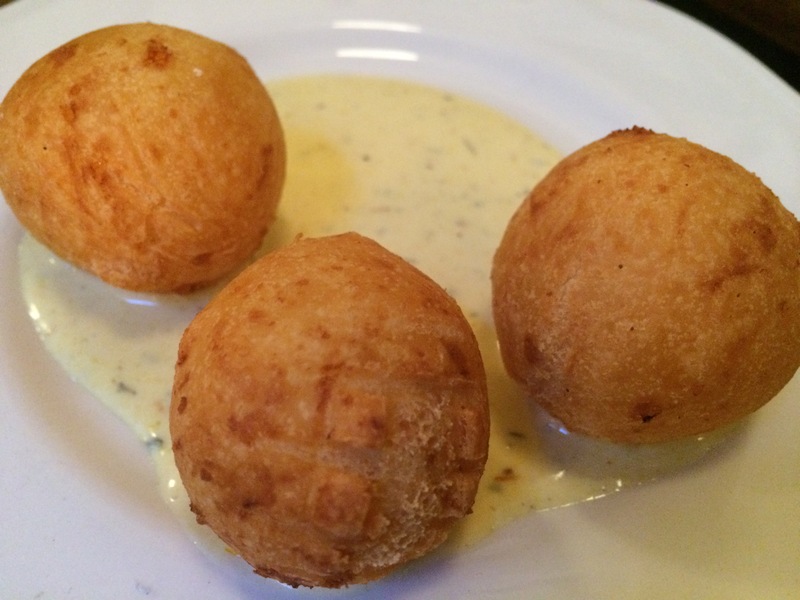 We start off with Bombas de Tiempo, a plate of cheesy balls with a speck of sweet and tangy quince jelly inside and served with an Amarillo chilli sour cream. Next we tried the famous Don Ceviche from the ceviche bar. This is one of their most popular ceviches with chunks of sea bass in tiger’s milk, a punchy marinade of lime and chilli, and topped with a citrusy red onion salad. 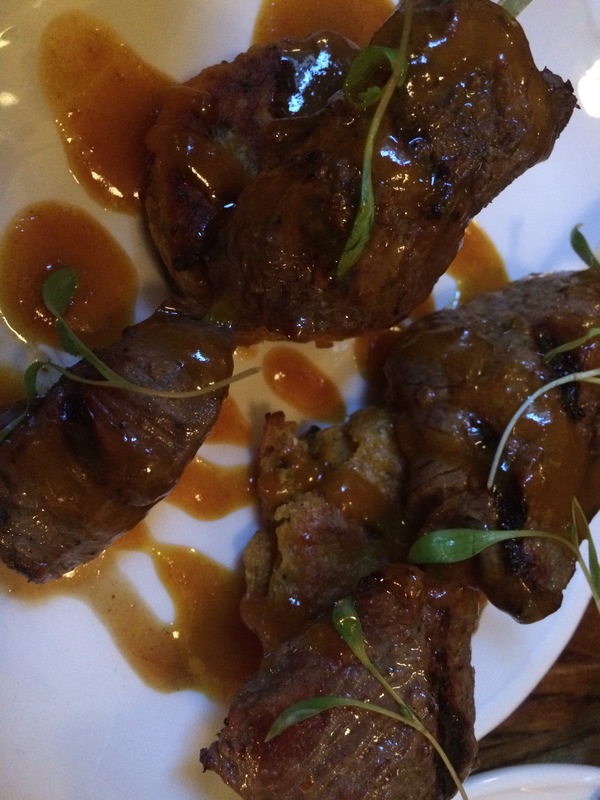 Moving onto mains, my friend opted for the grilled beef fillet with plantain fritters, all drizzled a sticky, BBQ like sauce spiked with blood orange. 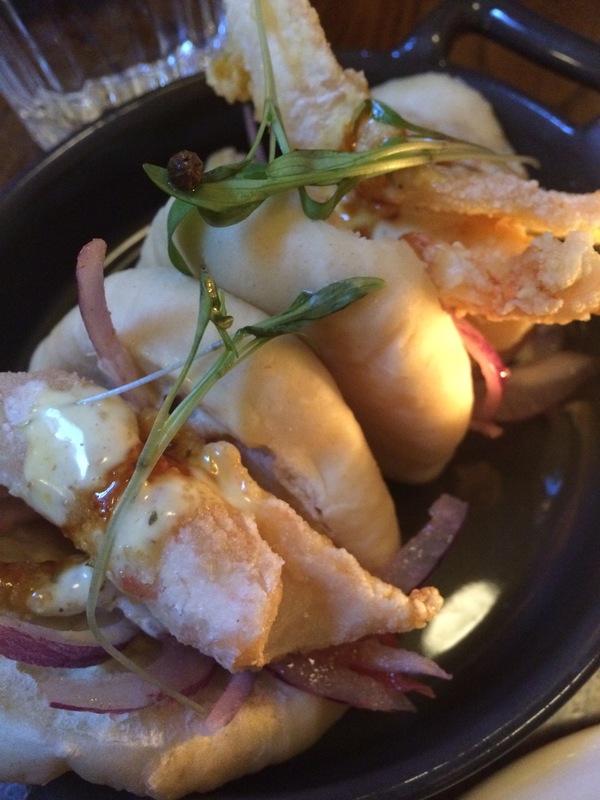 I opted for the Jalea steamed buns which came stuffed with deep fried salmon and sea bass. The dish was brought together with a beautiful salsa criolla made of peppers, red onions, potatoes and fresh cilantro and drizzled over with a chilli sour cream. The paper thin slices of fish were crisp and delicious and I was enjoying them so much that I ended up picking them out and was left eating the buns with the salsa only, still quite a fun combo. Finally onto dessert, we got the Rocoto Pepper Panna Cotta, with sweet potato coulis and quinoa crisp. The waiter had warned me that I might find this dessert spicy but I can assure you that it is far from spicy. The Panna Cotta was absolutely divine with the sweetness of the vanilla and cream balancing the mild heat of the pepper. 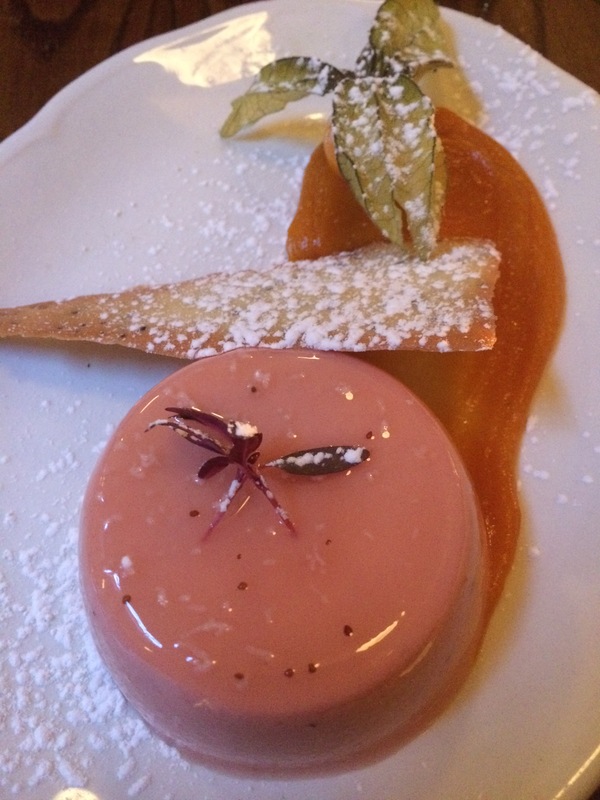 The sweet potato coulis is a wonderful complement that they need to start serving with more desserts! Anyone looking to try classic, superb quality Peruvian food, especially the trademark ceviches should definitely make a trip down to this place. If you didn’t book a place in advance, I’d recommend you to grab a pisco cocktail or two at the bar while you wait because these are absolutely tongue-tantalising. For BBQ dishes inspired by the Middle East and North Africa. 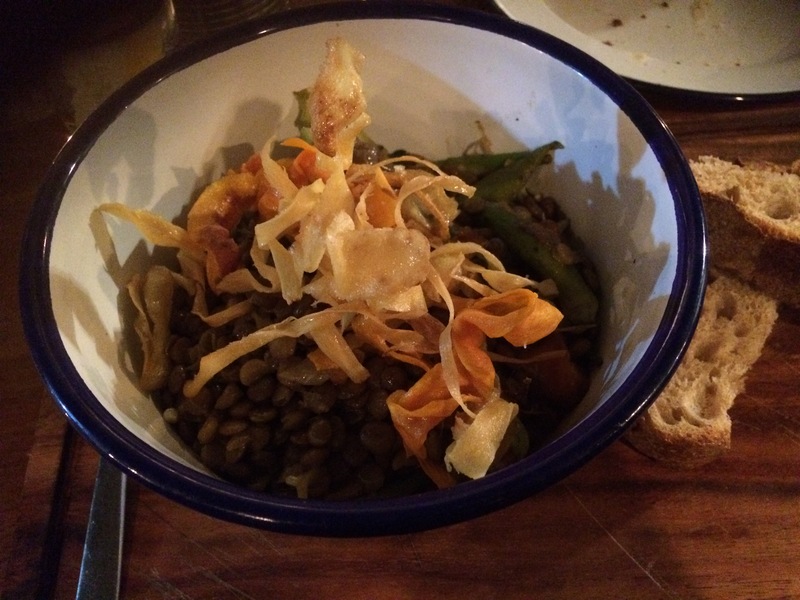 Located in Haggerston, the new and upcoming hipster neighbourhood between Shoreditch and Dalston, Berber & Q was packed with people even on a Tuesday night inspite of its recent opening and its hip location in a back street railway arch. With dim lighting, a combined bar and open kitchen and minimal wooden seating, the place definitely looks more like a club than a restaurant. 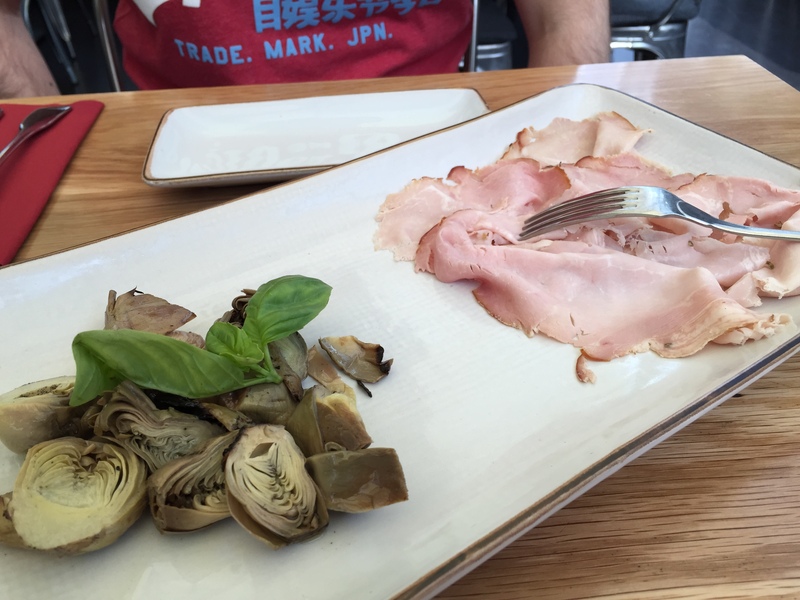 My only complaint was that the tables which were by the bar and the street-side windows were particularly narrow and log-like, so that placing and balancing our several ordered dishes on there seemed like quite the struggle. We started off with some exciting cocktails- mine had a tequila base with sweet pistachio syrup, which was very refreshing. My friend got the ‘Guy Berber’, which ironically was super pink and pretty. It had a lovely blend of orange liquer, raki, lime and pomegranate in a vodka base. The food here is a mix of small and large portions, so you can share a couple of small ones or choose individual large portions. We decided to share a few veg and meat dishes starting with the blackened aubergine with tomato and garlic and yoghurt. The aubergine and garlic yoghurt formed a silky smooth texture while the runny eggs added a fun twist to the smoky, zesty aubergine. Next came the joojeh chicken thighs and the hand pulled lamb. The chicken had a hint of saffron and paprika and had a wonderful charcoal-smoked flavor. But once I’d tasted the lamb, the chicken seemed fairly boring. 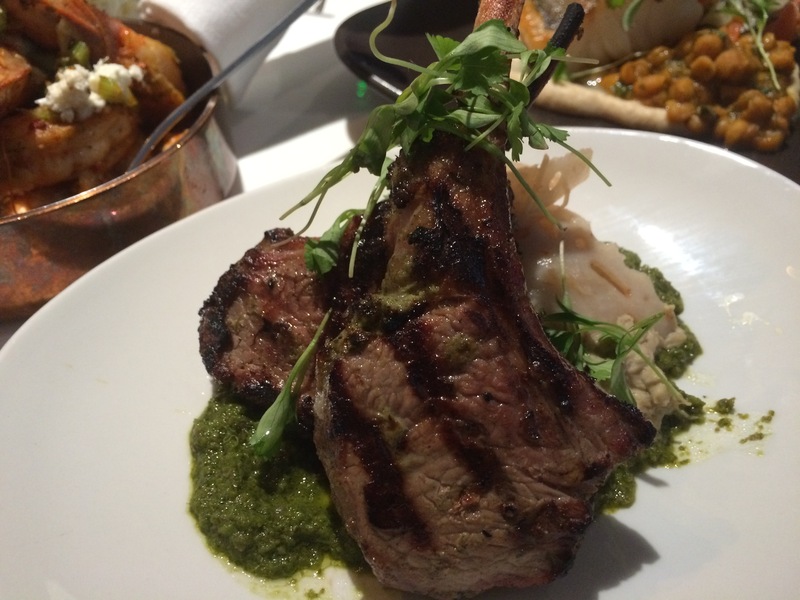 The lamb was beautifully roasted in cumin, garlic and coriander was extremely tender and was served with freshly baked pita bread. 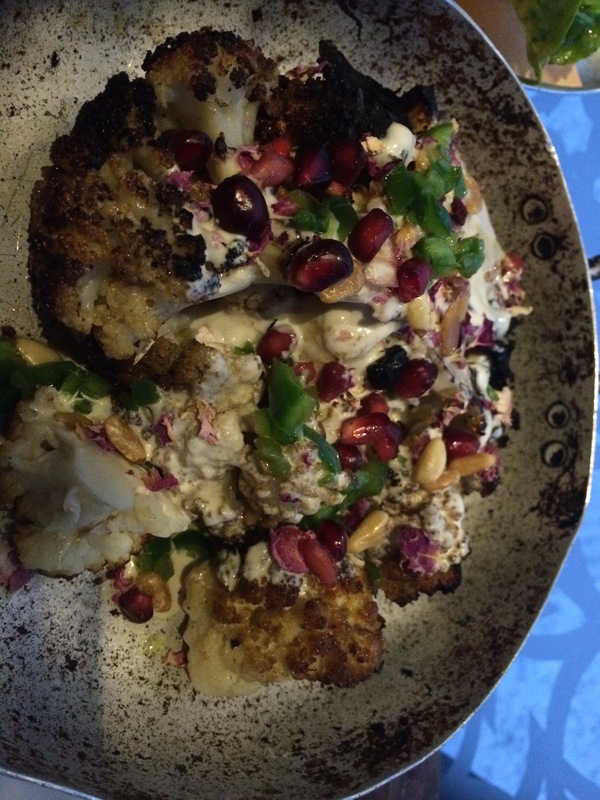 The final dish was the cauliflower shawarma, which was surprisingly my favourite. The blackened florets with the home-made tahini and yoghurt dressing with a smattering of pomegranate seeds was a winning combination. Service was very efficient and friendly. The waitress was so delighted by us having cleared all the dishes we ordered, she introduced us to the head chef, who was equally down-to-earth and humble. 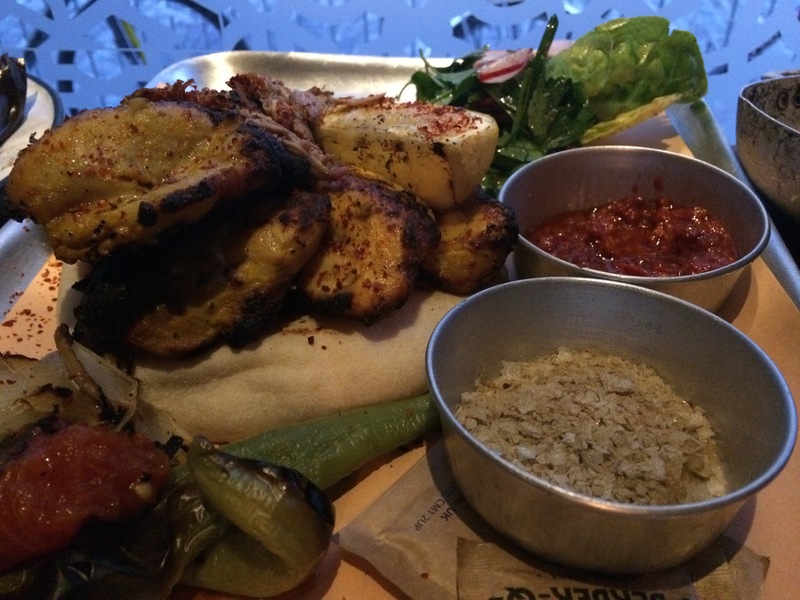 This is barbecued food with a wonderful Turkish and Moroccan twist. It’s the kind of BBQ that even veggies can enjoy without being restricted only to Halloumi. 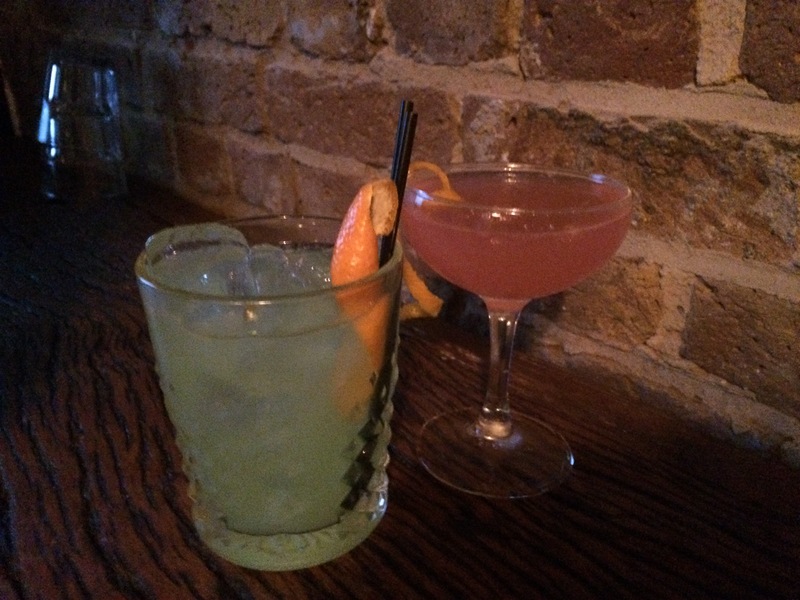 The cocktails are also spot-on and service is very attentive. There has been a lot of hype about this new kid on the block and it definitely feels justified. For traditional Italian in a family run restaurant that’s been running in the heart of Soho for almost 20 years. The restaurant is quite plain in comparison to its flashy neighbours but the tables outside are perfect for people watching in the summer. The waiters do warn you to be careful of being pickpocketed though! 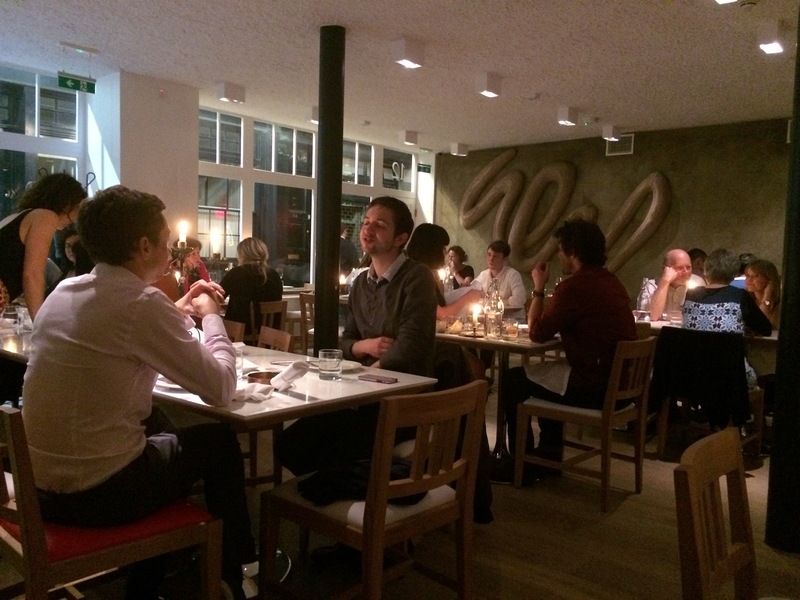 The set menu is one of the best value deals in Soho. 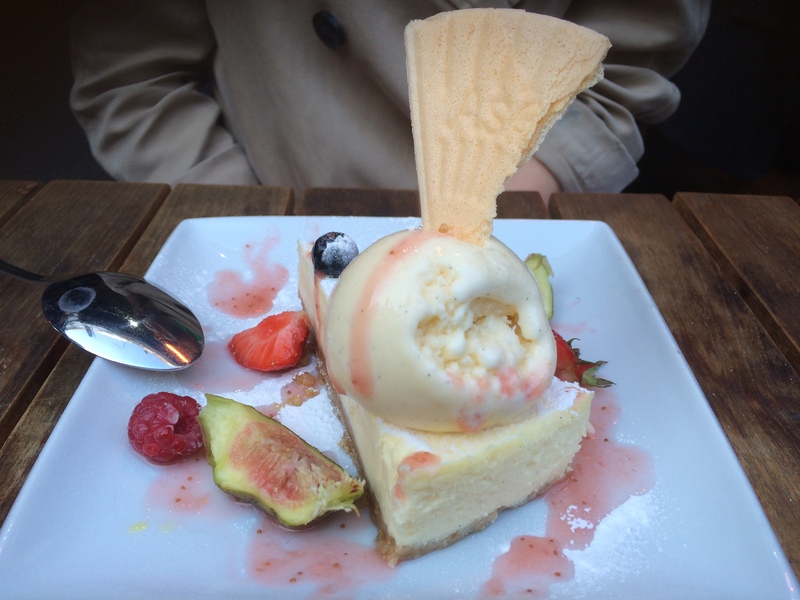 We opted for the 3 course lunch menu because it was a nice, sunny afternoon and what better way to soak up the sunshine than in the midst of Soho’s stylish crowds, sipping on wine and tucking into some lovely Italian. 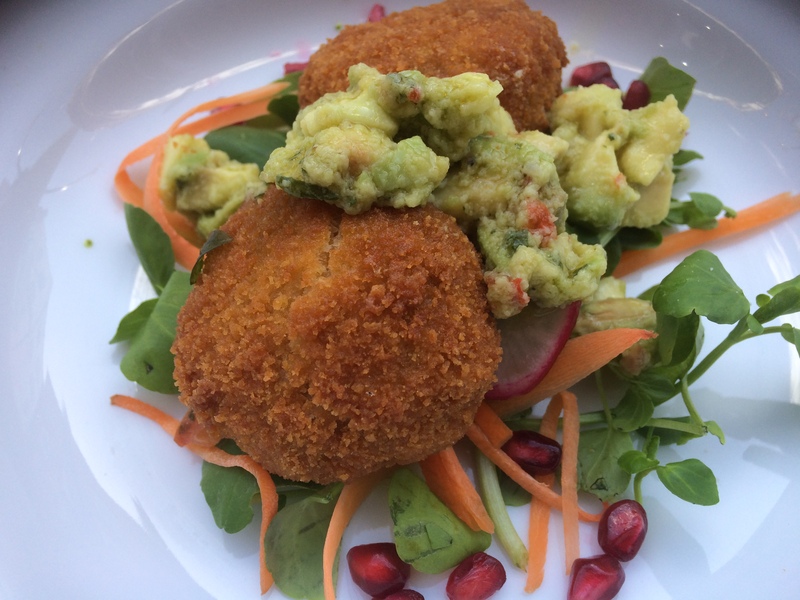 For starters, I opted for the crab cakes which came with an avocado salsa and a pomegranate & radish salad. The cakes were big and meaty and the crab was beautifully fresh. 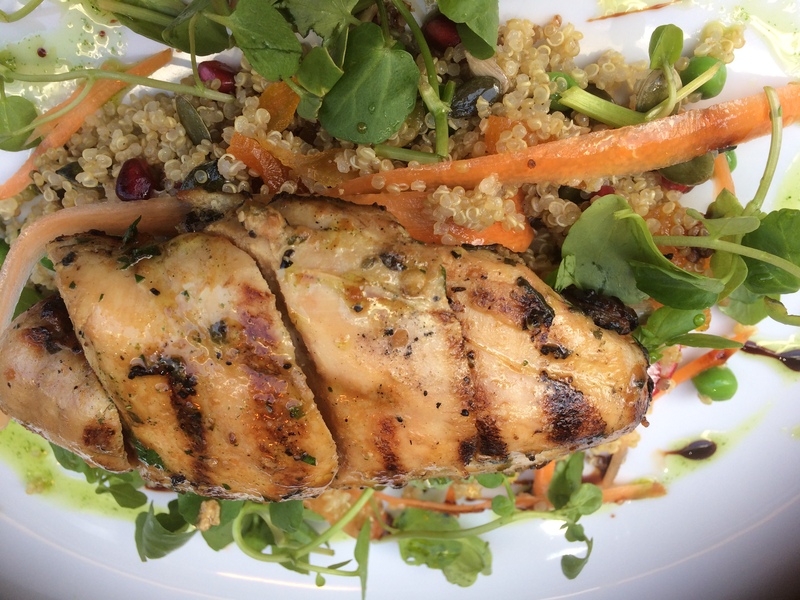 My mains was a grilled chicken dish with a quinoa salad. The chicken had a nice chargrilled skin on the outside but the inside felt a bit bland. Also, the quinoa, though tasty, was slightly greasy and made the dish seem a bit heavy overall. A lighter, fruity quinoa side would have better complemented the chicken. My friend’s main was spaghetti in a white wine sauce, loaded with juicy clams was much better. 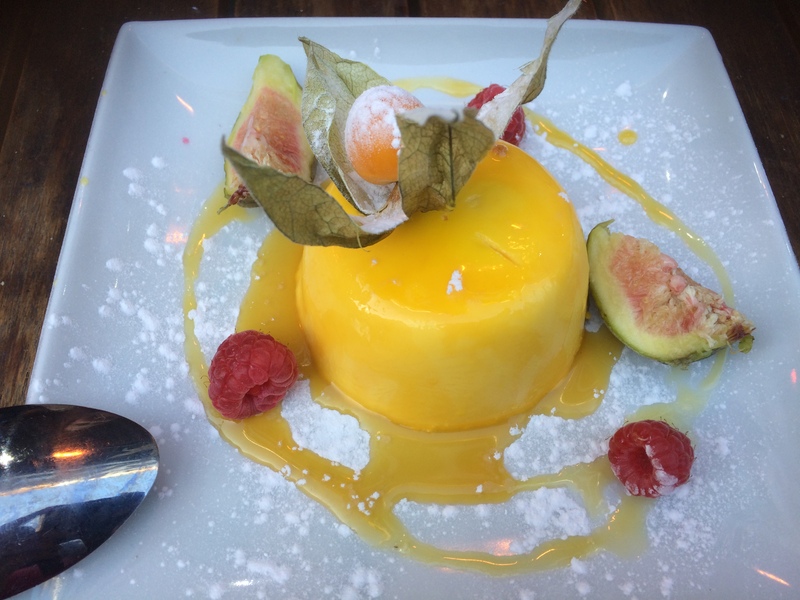 For desserts, my friend got the cheesecake which was decent but I was definitely the subject of food envy of several fellow diners with my orange panna-cotta- a rich and intensely creamy texture with the fresh flavours of orange and honey and srved with fresh figs and raspberries. 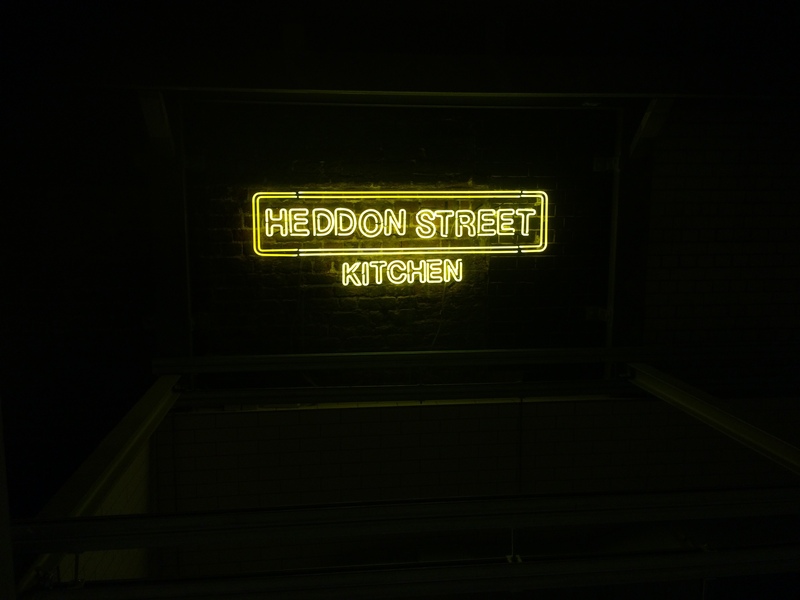 The food isn’t exactly innovative but its good quality and definitely one of the best value set menus in Soho! The people watching aspect is of course an added benefit, providing constant entertainment. 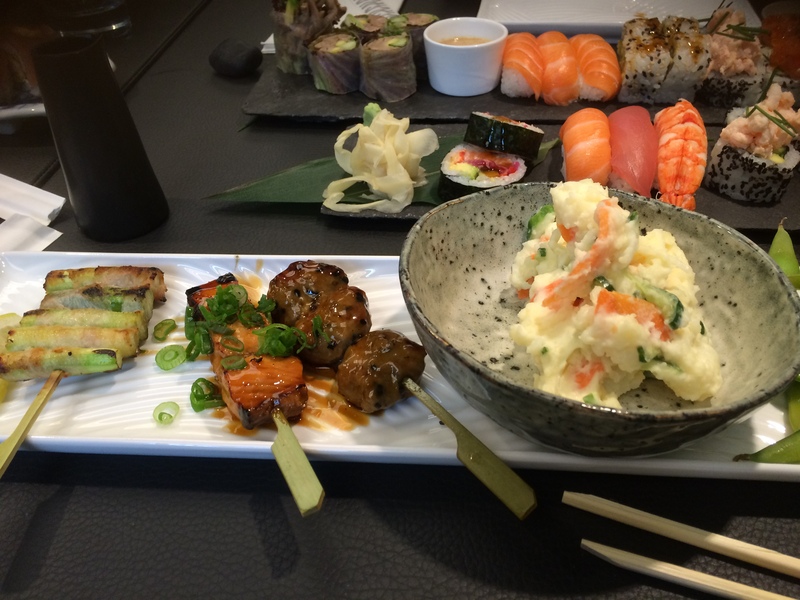 For trying out exciting combinations of traditional sushi and grilled Yakitori sticks, served with a Nordic touch. But don’t be confused, the Nordic touch is not for the food, but for the settings. Situated in the new Crossrail mall in Canary Wharf, the restaurant is a display of Scandanavian chic- wooden and leather furnishings, rectangular halogen light frames suspended from the ceiling and monochrome art works. This place was definitely the best value for sushi out of London’s long list of Japanese restaurants I’ve visited, considering how well they do on both the taste and presentation front. The menu is quite confusing though. This is partly due to the plethora of dishes on offer and partly because the menu is segmented into sections using abstract photographs instead of calling out the categories of sashimi, nigiri, futamaki, kaburimaki etc. Although, once I had figured out what the pictures were all about, I admit that I found the concept to be quite cute. Check out the menu on the website to see what I mean. If you’re as indecisive as me, you are best placed to go for the set menu options. After a fruitless twenty minutes of flicking through the main menu, my friends and I decided to go for some of these. We ordered the Mixed Emotions and the Mini Maki de Luxe. Two of the Kaburimaki (topped Maki rolls) stood out the most for me. The Hell’s Kitchen which was a roll of tempura shrimp, avocado, spicy sauce, topped with tuna & barbecue sauce as well as the Formidable roll which was made of avocado & cucumber, tossed in sesame, topped with salmon tartare & trout roe. So many different ingredients in such small rolls, yet all vividly coming across in each mouthful. This was also the first time I tried Yakitori- Japanese style chicken and fish skewers, coated in a sticky teriyaki sauce and then chargrilled to perfection. The grilled bacon-wrapped asparagus rolls were a wonderful twist on the standard Parma-asparagus dish, with the added hint of soy and garlic and a nice smoky flavor. Desserts were small but very innovative. 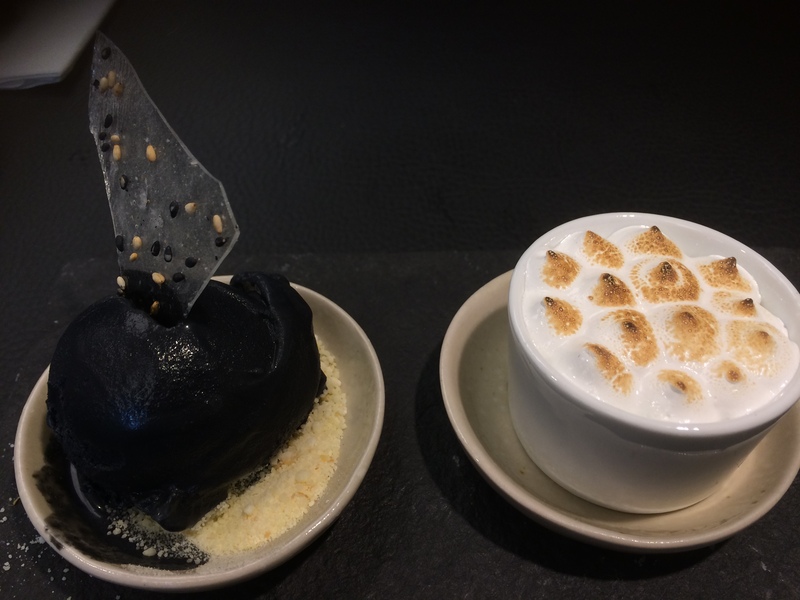 We tried the Yuzu Crumble and the Black Sesame ice cream. The crumble has citrusy yuzu curd with a warm meringue topping. The ice cream had a nutty, earthy flavor from the black sesame and a coarse granular texture from the blended sesame and nougatine. This was a surprisingly nice change to the usual creamy, plain texture of standard ice cream. But a word of warning- the ice cream makes your mouth go entirely black (or at least it did for me) and so this dessert is better avoided if you’re on a date! 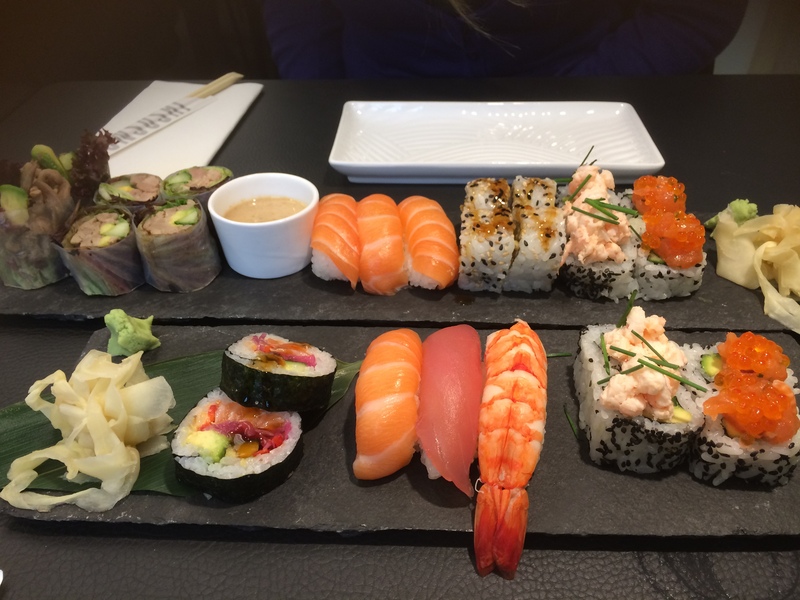 Inspite of being one a chain, Sticks and Sushi manages to impress with the presentation, taste and creativity of the dishes, which are also very pocket friendly! If you do visit, go for one of the set menus. The mini desserts are also all pretty unusual and fun and definitely worth a try! For rotisserie chicken and excellent whisky based cocktails. 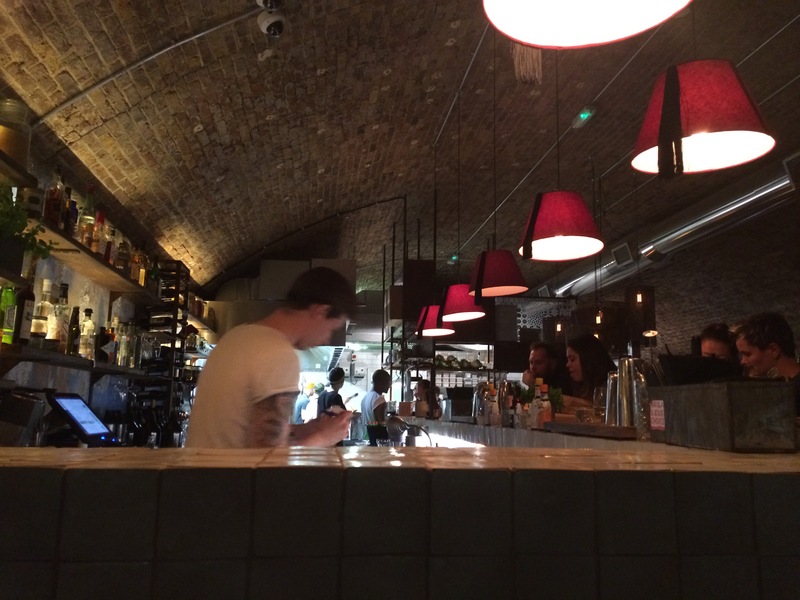 The restaurant has the Shoreditch hipster vibe in combination with an oriental influence. 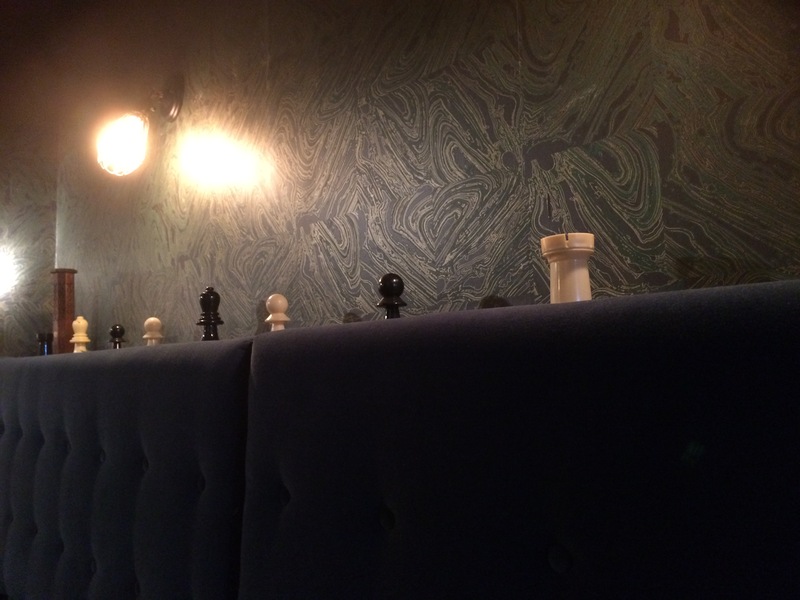 Geisha wall art, giant chess pieces and medicine bottles adorn the venue. But most exciting of all is the extensive array of whiskies on display at the bar- the restaurant has a collection of over 30 different Japanese scotch whiskies. The menu is short but with some very tempting offerings. 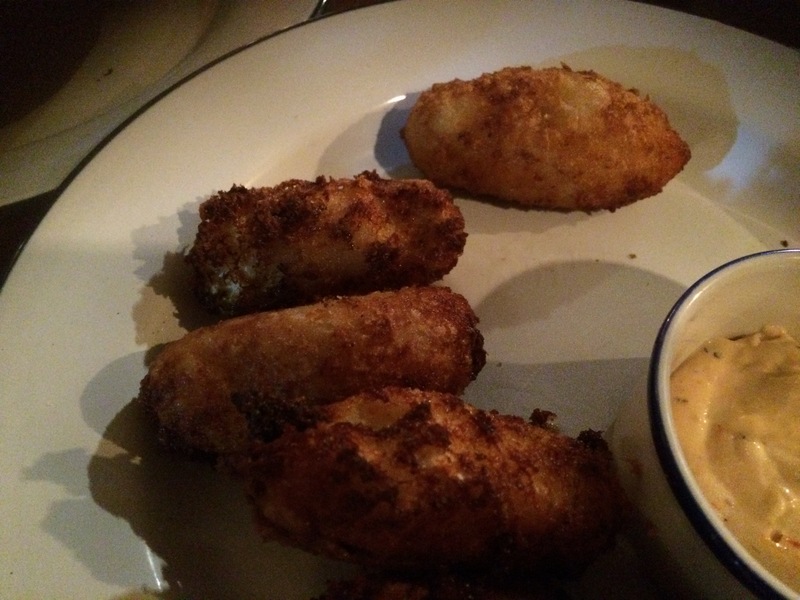 We start with the cauliflower cheese fritters. The gooey mix in the crispy batter is artery clogging, yet too good to put down. For mains, I was intent on having the rotisserie chicken, but to my dismay the restaurant had run out of it which meant I had to settle for the next best on the menu. 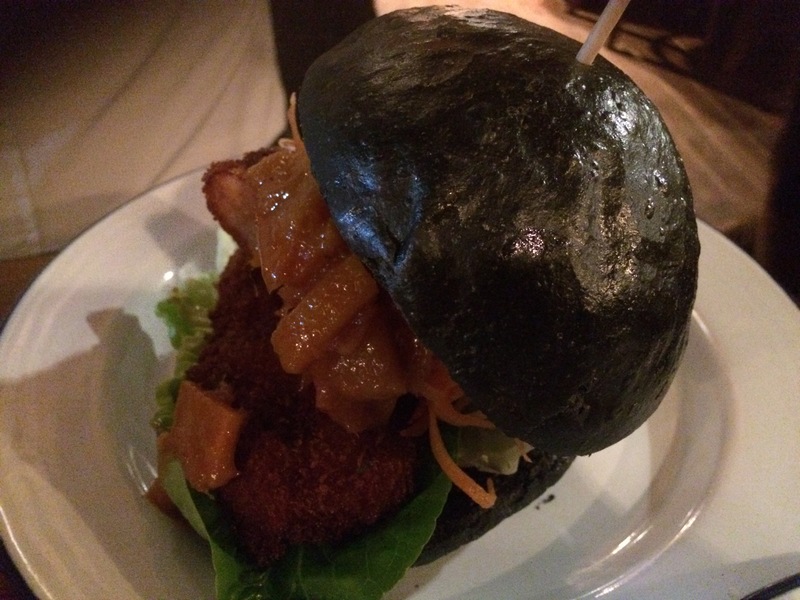 The crispy, panko-crusted chicken with a radish mayo sandwiched in pitch-black, charcoal brioche buns. Despite the stark contrast in colors, the buns taste just like regular brioche buns which was slightly disappointing. That said, the burger still taste pretty damn good. The spicy radish mayo adds a nice kick to the sweetness of the brioche and chicken was crispy and succulent. The lentil curry with sweet potatoes was a comforting, yet felt too-healthy and not as great on the looks aspect as the other dishes. 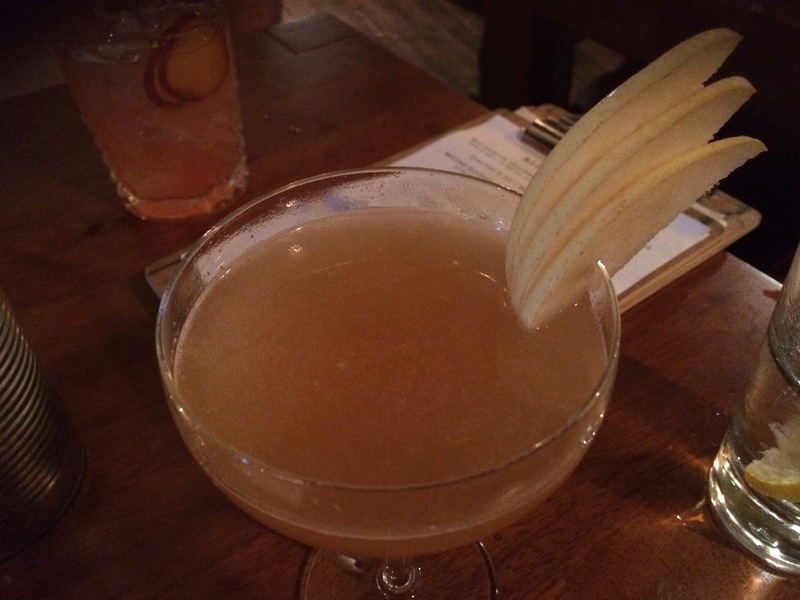 But the place does really excel with its whisky cocktails which ranged from the standard Old-Fashioned to the unusual Wabi-Sabi which included Matcha green tea syrup and walnut bitters. The place is a must try for any whisky lovers out there. It helps that the food is also pretty inventive and done well. Perfect for grabbing a quick bite before your Shoreditch night-out. For modern British cuisine, focusing on the use of high quality local produce and lots of exciting, under-utilized ingredients. The restaurant has a cosy, country house feel to it. The place is decked with wall-prints themed on food and farming and has velvety blue and pink upholstery. Although the name of the place and the look on the outside give the appearance that the place is more like some rural pub, the interiors are charming, the service efficient and friendly and the food much more carefully and expertly prepared than a pub. 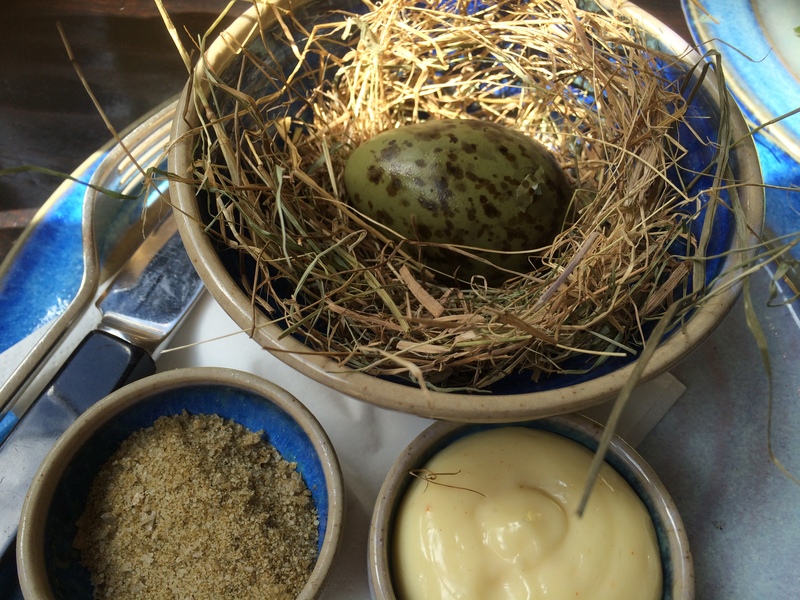 We start off with the Coddled Duck Egg dish and the Truffled Goat’s Curd. 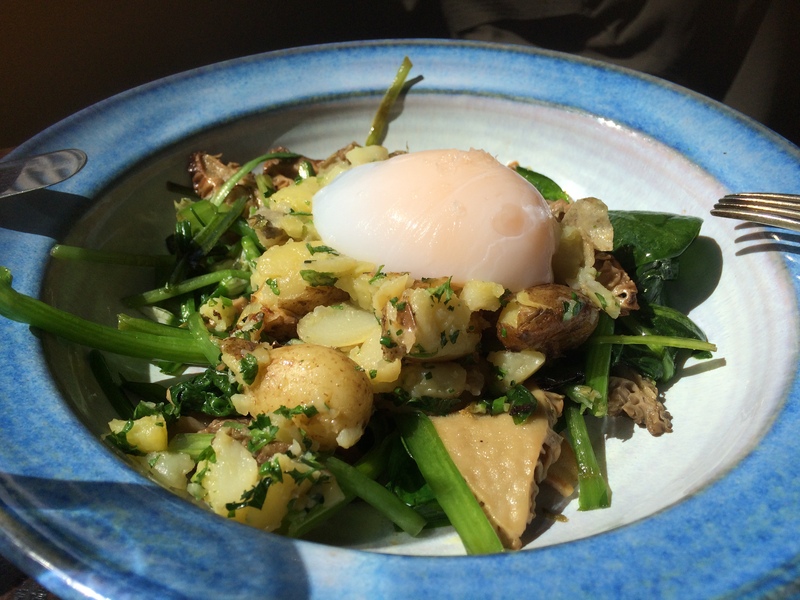 The duck egg came with a plateful of herbed New Jerseys and lots of fresh mushrooms. A whole-n-hearty dish. 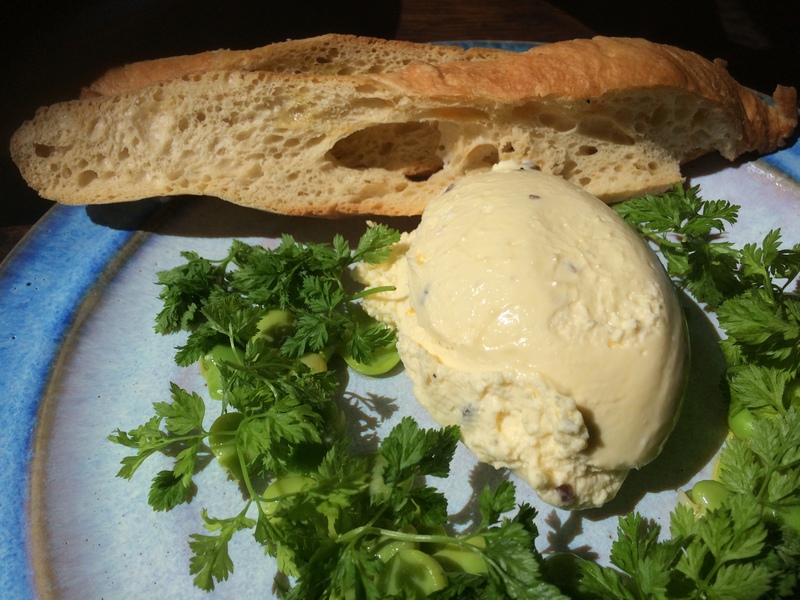 Yet the truffled goat’s cheese was much more of an impressive dish in my opinion- the texture of fresh clotted cream, a mild hint of goat’s cheese and every bit decadent. The sea gull egg which I ordered purely out of curiosity was my disappointment in the meal because other than the bright green shell and the extra orange yolk, the egg was identical to your everyday supermarket egg. Not worth the price tag at all. For mains, I opted for the ray fish which was as much of a treat to the eyes as the tastebuds. 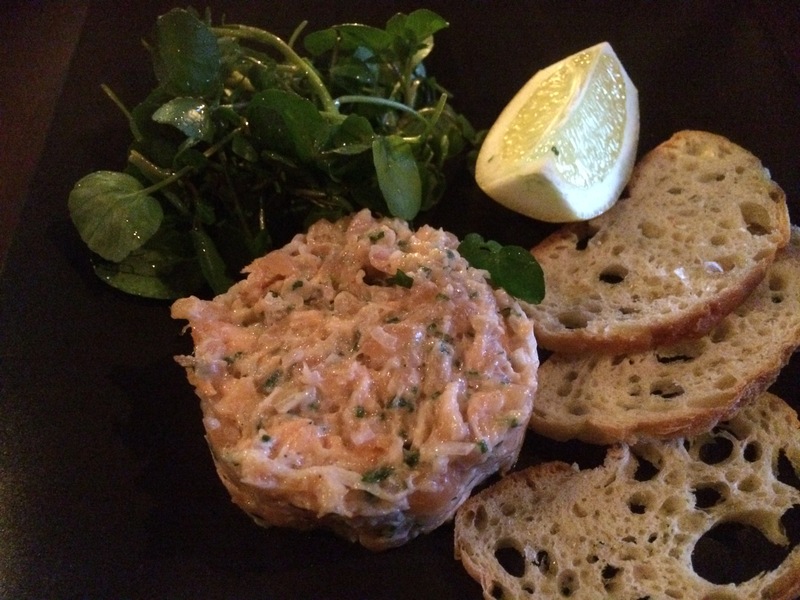 Newman Street Tavern is about the use of high-quality and often unusual ingredients to add a welcome twist to many British classics. The attention to detail is obvious from not just the cooking, but also the décor of the venue as well as the service. All this make the place well worth a visit. 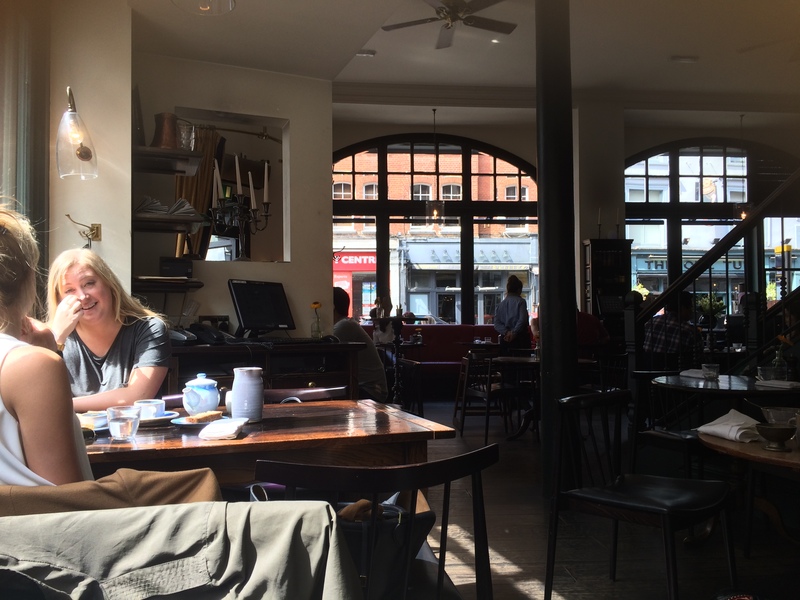 It helps that the restaurant is situated right next to Oxford circus, so it’s a great location for a long boozy brunch or a quick lunch, depending on how crowded the Oxford Circus shops are and how into shopping you are. If you want to have a pocket friendly 3 course meal at a Gordon Ramsay establishment. Spread across two floors, the restaurant has a slightly industrial feel to it with the exposed pipes, the uniformly sized wall hangings camouflaged into the walls and the all black seating. We opted for the pre-theatre menu since it offers three courses for the price of one on the al-a-carte menu. For starters, I opted for the smoked haddock and salmon fishcake which had the right balance of creamy and zesty. 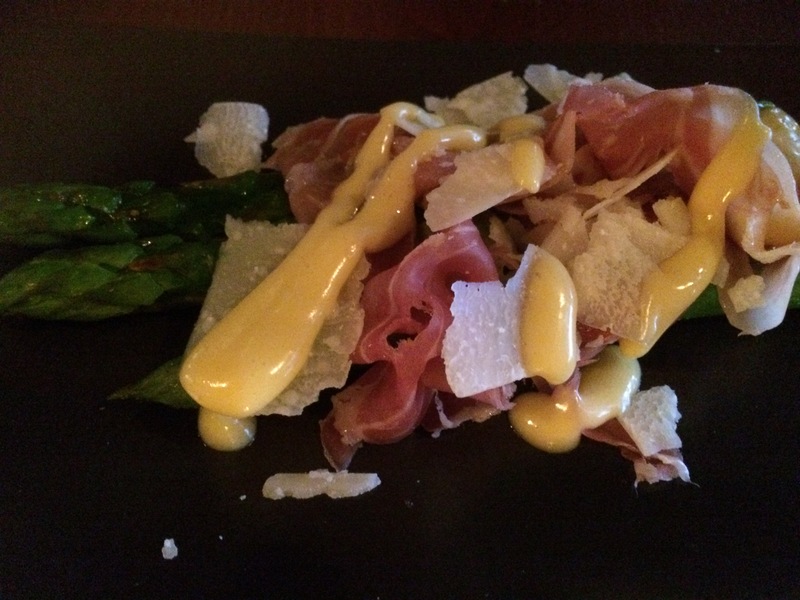 My friend’s starter of asparagus with parma ham, hollandaise and parmesan was good but was too simple. I find it hard to find a dish impressive if it is so easy that I can make it myself at home, except for the hollandaise I guess. 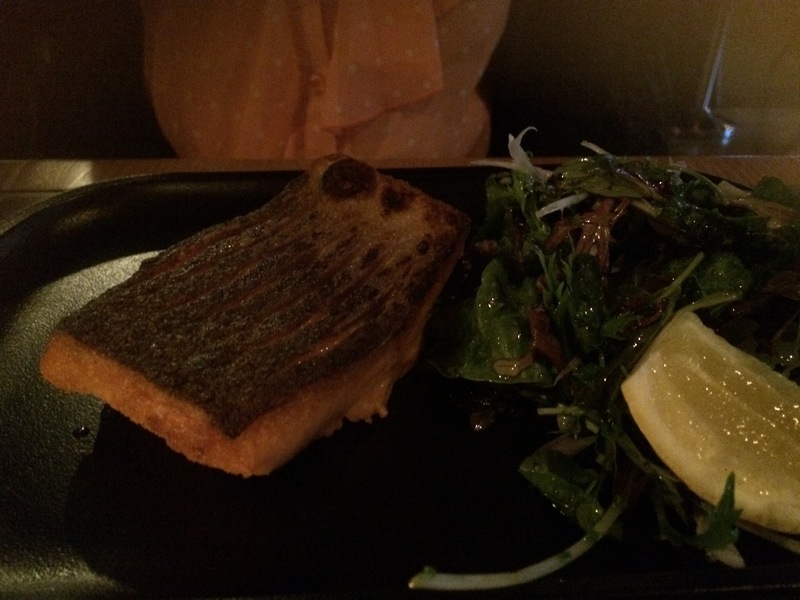 Moving onto the mains, I ordered the wood-oven roasted trout with a caper and watercress salad. The fish was pink, fresh and crisp-skinned but the salad felt too leafy. A salad with more body would have made so much difference to the taste and texture of the dish. 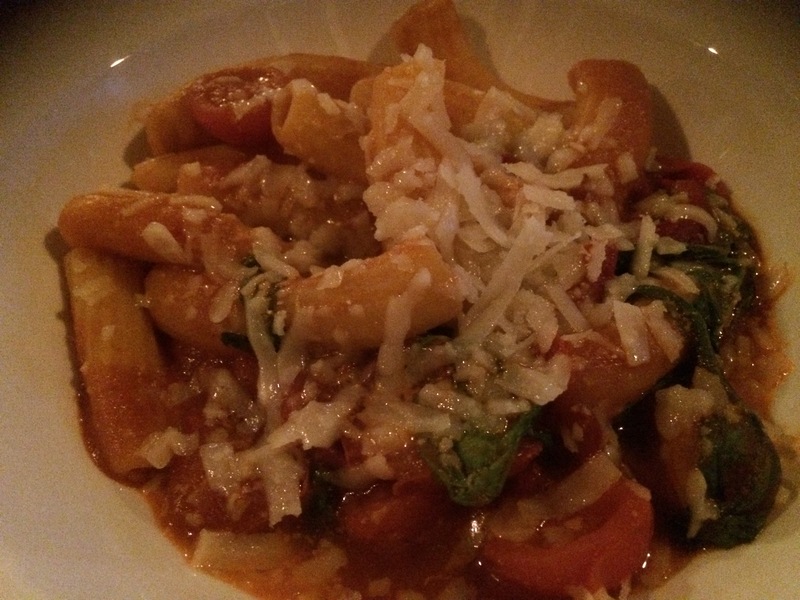 My friend got the rigatoni pasta dish which was cooked perfectly and the roast pepper sauce with it was aromatic but the ricotta, as promised on the menu, was undetectable. The only hint of cheese was the sprinkle of parmesan on top. 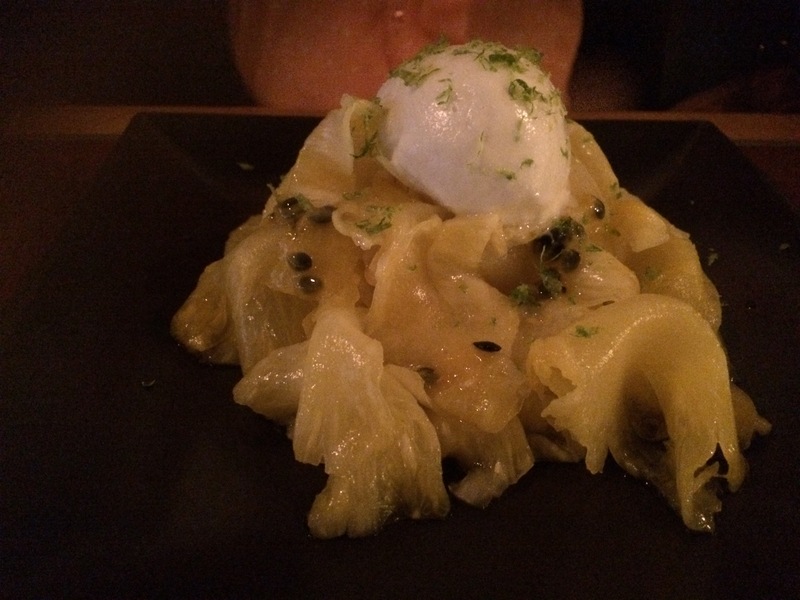 For dessert, my friend definitely made the better choice with the pineapple carpaccio. The pineapple slices were chargrilled and then dipped in passionfruit coulis, served with a dollop of fresh coconut sorbet. A light and refreshing way to end the meal. My dessert on the other hand, was of ordinary vanilla ice-cream topped with just a handful of walnuts and some caramel sauce. Utter disappointment. The set menu might be cheaper but you’ll definitely be better of getting dishes from the al-a-carte menu. 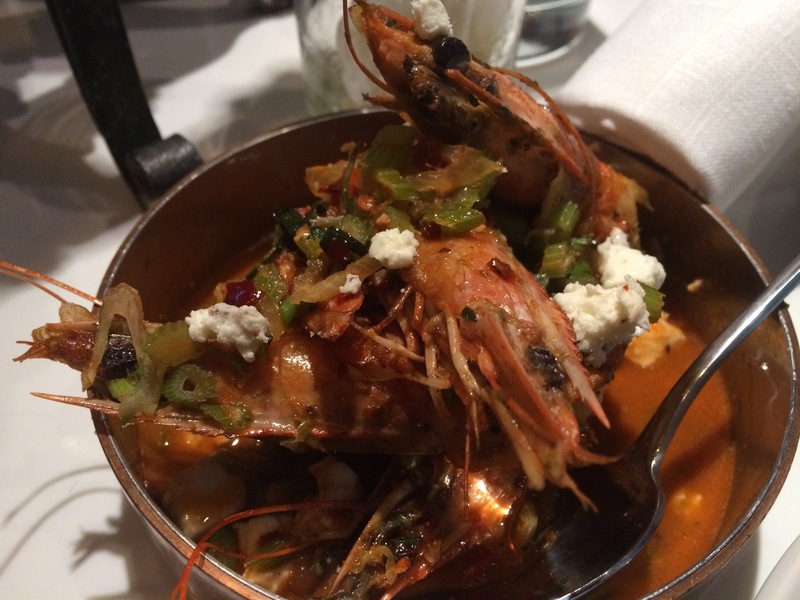 The dishes aren’t as innovative as at Ramsay’s other restaurants but a lot of them are enjoyable mainly due to the use of high quality ingredients and because the kitchen staff does have talent. Shame the menu doesn’t give the chefs many opportunities to showcase this talent. If you love mozzarella and want to try some freshly-made authentic Italian mozzarella. The Canary Wharf branch is right next to the station and is set in the middle of the corridor of the Wintergarden building. I always felt that they could have chosen a slightly less conspicuous space. Yet somehow when you’re dining here, the slightly elevated platform and the massive central bar ensure a decent amount of segregation from the humdrum of the commuters. Contrary to my belief, Obica doesn’t just serve dishes with mozzarella. There is a section dedicated to the cheese though- extra creamy, smoked and standard versions available in mini, medium and giant portion sizes. We opted for the smoked version. 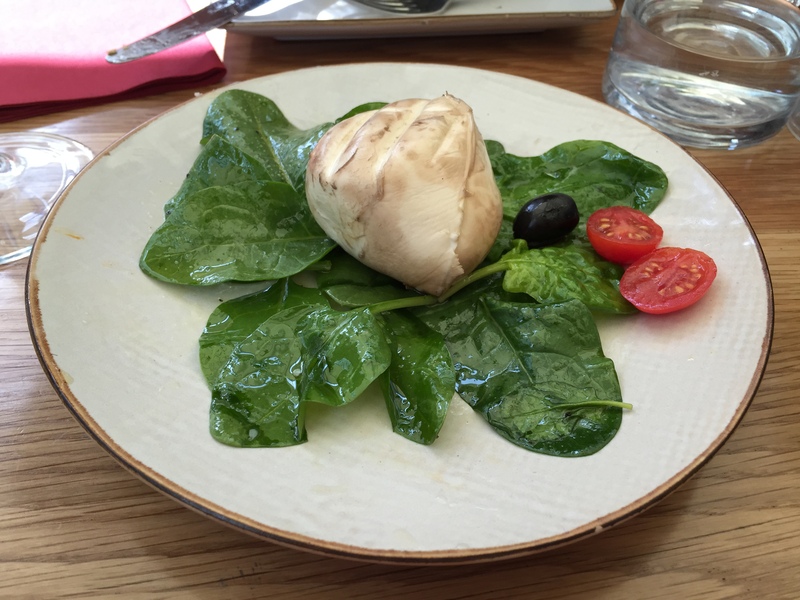 The mozzarella was visible fresh and delicious but the smoky flavor was quite intense and slightly overpowered the mild creamy, milky taste of the mozzarella. We also decided to try with some of the non-mozzarella startes. 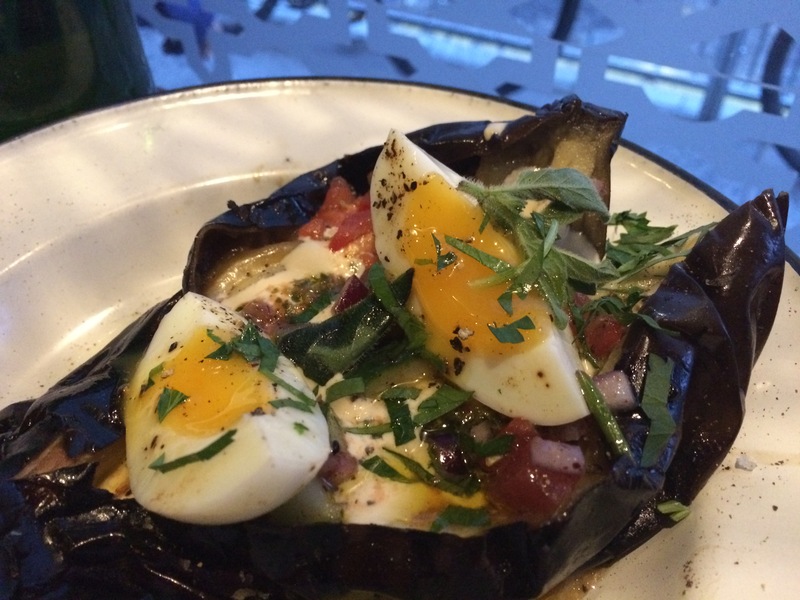 These were grilled artichokes in olive oil and Caponata. Caponata is a Sicilian aubergine dish with nuts and capers. The dishes were simple but tasty. I did have a complaint about the portion sizes though, which were extremely small considering the prices. 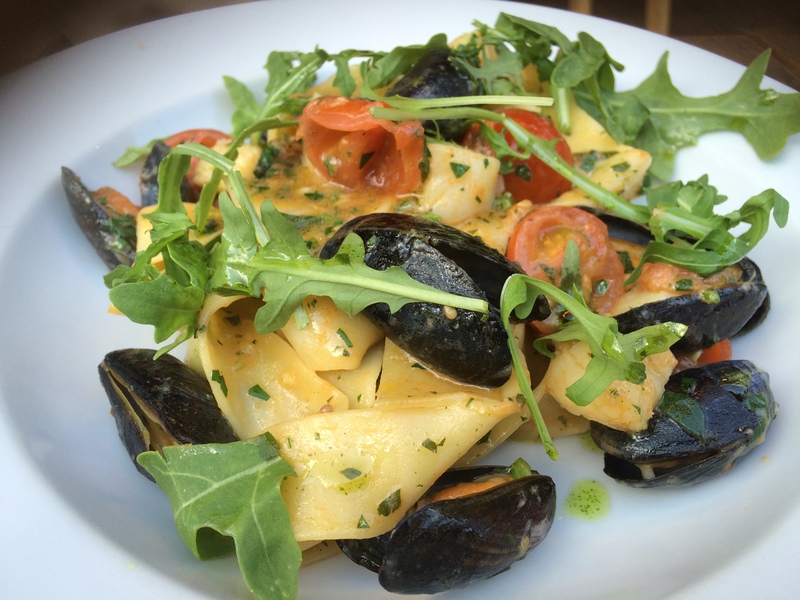 For mains, I got the Tartafo di San Miniato, one of the best pasta dishes I’ve had in a while. 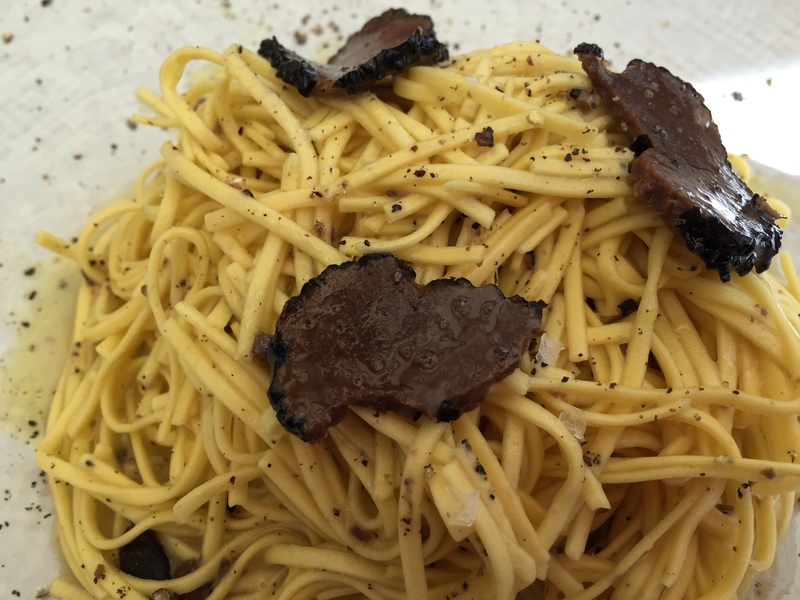 Spindly, skinny spaghetti with charcoal roasted ricotta, mozzarella and a generous splash of truffle oil, finished with some truffle mushroom slices. We finished with the dessert tasting platter. The choco-almond cake and the ricotta strawberry chessecake were both decent, but what stole the show was the tiramisu. 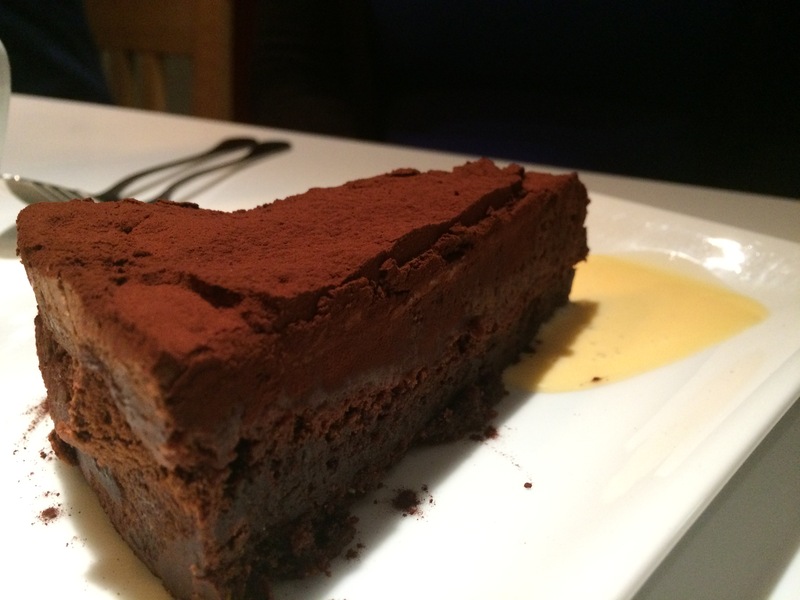 It was creamy, melt-in-your-mouth goodness with just the right balance of coffee and cocoa. 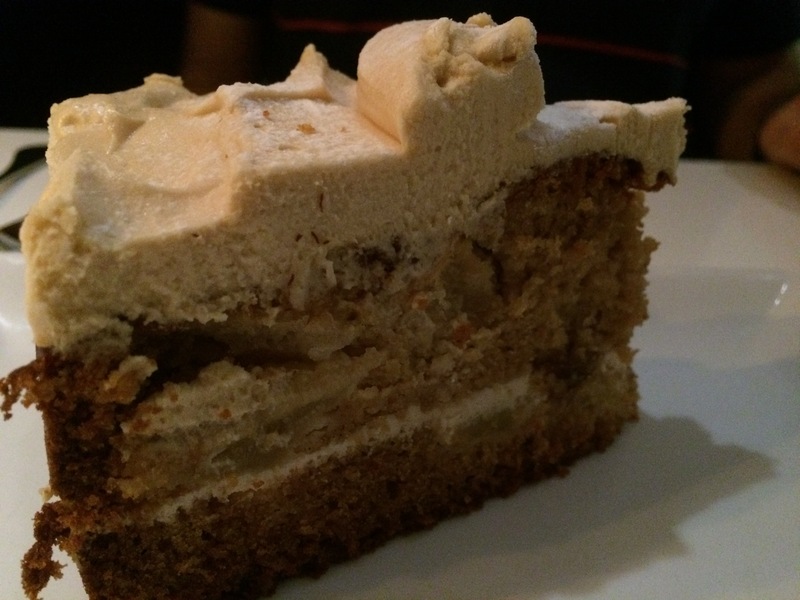 Even my friend who isn’t a fan of coffee found the tiramisu to be wonderful, which says a lot.